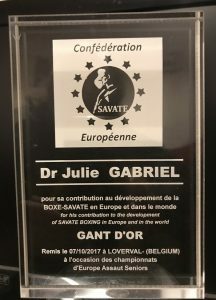 Dr Julie Gabriel, President of FISav and founder member of the GBSF, was awarded the prestigious honorific Gant d’Or, or Golden Glove, at Loverval in Belgium, by the European Confederation in October 2017. Very many congratulations from the GBSF! Brighton Savate is absolutely delighted to be putting on an event for the first time on England’s south coast on APRIL 7th-8th 2018. Very many congratulations to James Southwood on gaining his GAT1 (first degree silver glove) at a grading in France this summer, making him only the second GBSF memer ever to do so. Read the GBSF newsletter to meet our new Club Instructor, Sam Byford-Winter and get an update on recent events. Read the GBSF newsletter to see your representatives on the Executive committee, elected at the November AGM, hear about the exciting new Head of Media and Technology and learn about our keyword for 2017: ‘Outreach’. Results of the British Savate Assaut Championships 2016 held in Farncombe, Surrey on 23rd July.